Few young people from low income backgrounds progress to STEM careers. Connecting young people and researchers, UCL graduate Rebecca McKelvey’s non-profit organisation gives young people a chance. Science, technology, engineering and mathematics (STEM) are subjects that can lead to lucrative job opportunities and fulfilling careers. Yet interest in these subjects tends to wane among secondary school children for many reasons, including misconceptions of what it means to be a scientist. Children from low income backgrounds are at a particular disadvantage as it is more difficult for them to gain work experience in science fields, due to a lack of contacts and exposure to experts in their areas. This has a significant knock-on effect, as research by the Wellcome Trust shows that a lack of educational opportunities to engage in real science leads to long term educational and economic disadvantage. Research shows that fewer than 10% of life science professionals and just 6% of doctors are from working class backgrounds. While studying for her PhD in Neuroscience in the UCL Division of Biosciences, Rebecca had an idea for giving young people from low income backgrounds opportunities to gain practical insights into STEM subjects. With university researchers in STEM subjects volunteering and being mentors to these students, as well as creating opportunities for young people to experience labs and other practical aspects of STEM, Rebecca imagined more young people would be inspired to study subjects that would maximise their future employability. Rebecca entered the UCL Bright Ideas Award competition (now the ‘Launch £10,000 programme’) and won the £10,000 prize. Gaining a space at The Hatchery – UCL’s business incubator for startups and new enterprises – and with other support from UCL Innovation & Enterprise, she was able to turn her ideas into reality by launching a non-profit organisation, in2scienceUK. She quickly put her ideas into action in secondary schools across London, providing mentors from universities, science placements and careers guidance to more than 1,000 young people. 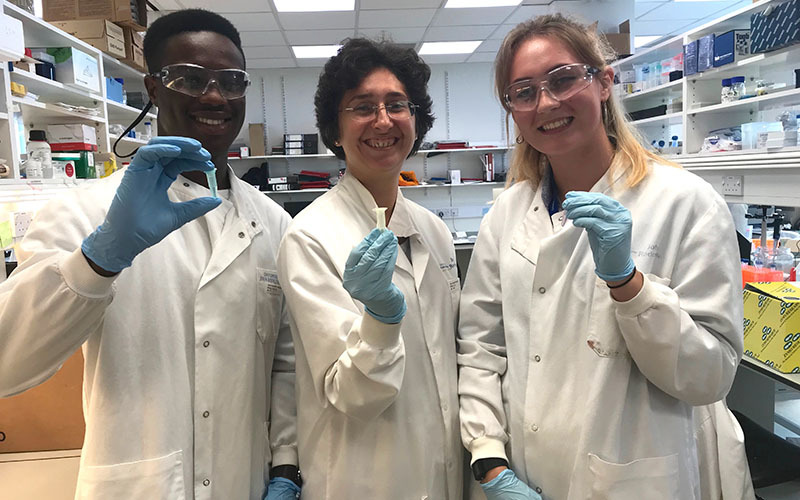 To date, in2scienceUK has worked with 326 schools and 590 volunteer researchers – of whom 339 are based at UCL – who offer their time to inspire young people. Over 70% of participants progress to university and on to STEM subjects. Demand for in2scienceUK programmes has now become so high that the organisation has introduced an application and interview process, to ensure those who can most benefit from participation gain access to these opportunities.